As a mom, it is impossible not to constantly question whether I’m making the right decisions for you. Lately, one of my worries as your mom has been about how much is too much when it comes to allowing you to go after your soccer dreams. In my mind, you’re still so young and you are blessed with many talents. I want you to explore, try lots of things and most importantly to just be a kid. When you’ve got practices several nights a week (some that keep you out past your bedtime on a school night) and games and tournaments that can be all day and all weekend long, I wonder if this is healthy for you. Then there is also the fear that I’ll be seen as one of “those” moms. The ones that push their kids into some pursuit out of their own need for admiration or unfulfilled aspirations. 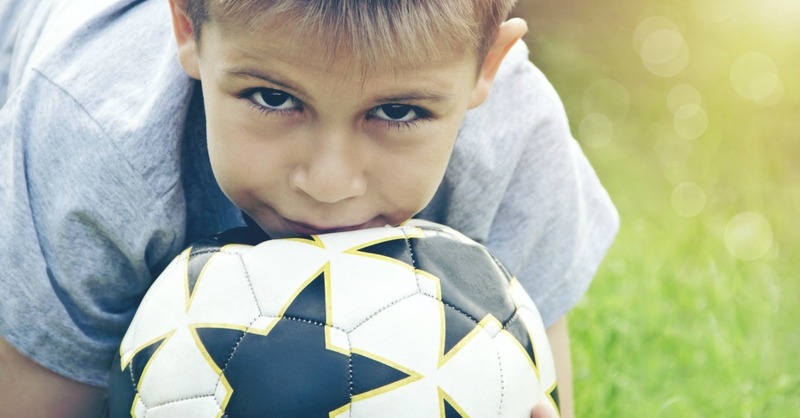 But through your passion for soccer, bordering on obsession, you recently taught me what will probably be one of my most valuable lessons about being your mom. A few weeks ago at a tournament, your fairly new team, which should have had six players, was short three. This meant that each of you had to play EVERY game, the WHOLE game, for UP TO FOUR matches that day. If any one of the players on your team was to be injured, that would be it for the game and the tournament. By game three of the day, you were red faced, drenched in sweat, bruised and battered. And yet in the brief break you got between games it was nearly impossible to keep you sitting down in the shade to rest. When the next game time came and the other team moved toward the field, the parents exchanged worried glances as we knew the team was older, bigger and had been playing longer. They also had a full six players, giving them the opportunity to rotate players. They were polished and refreshed, while your team was still rough around the edges and worn out. At the beginning of the game your team was holding its own. Then, about 8 minutes into the first half, I watch as you collide with another player and go down. You roll around on the ground in pain. I hold my breath, my heart pounding, I can feel the tears… Suddenly, you are up, fierce determination across your face. The game will go on. The ball goes back in play. All three of you hunker down for what you know will be an almost unwinnable situation. You might lose, but you aren’t going to make it easy for them. Every exchange is a battle. The speed of the game picks up as players pass, balls are fought over, sometimes won and sometimes lost. A score is made, but it’s not yours. Again, the ball is kicked back onto the field. You run for it with energy you don’t have, and then in the corner of my eye I see the other players coming. A wave of colors is upon you, and you hit the ground, again. I stop taking in air. This time you don’t bounce right up, your body heaves as you sob, you roll yourself into a ball. My tears start flowing freely with my sunglasses hiding them from the other spectators. I’m screaming in my head for your father (and coach) to run to you and pick you up. I want the stupid game to be over, it’s only a game, you’re just a little boy! There are no players to sub in for you and half time was imminent. A brief reprieve is given with consent of the other team to take the break early. Your father finally peels you off the grass and scoops you up and over to the sidelines. You’re still crying as the other fathers/coaches hover over you. Although I can’t hear their words, I know they are persuading you to shake it off and get back in the game. I’m so furious with them, I’m almost shaking. Yet, I see you start gulping air in an attempt to pull it together. Part of me feels like this is so wrong, you are only six years old and this is too much to ask of you. The game is lost anyways, why go on? Then as you stand on wobbly legs, and walk forward with a limp, you raise your head and it’s clear that it’s not what others are asking of you, but a drive that is coming from inside of you. It is more than I can comprehend. Beyond exhausted and obviously injured, you slowly move back onto the field, the limp fading ever so slightly with each step. They put you on defense in an attempt to give you a moment of recovery, but as the ball is dropped amongst dueling cleats, within a moment players are again bearing down on you. The pain your still feeling is evident, but somehow rather than holding you back, it propels you to engage one more time and meet the oncoming rush. In the remaining minutes of the game, I watch you with awe and pride. When it ends, with a loss but nothing close to a defeat, I realize that I am still crying. However, it was no longer about my own fears and doubts or your pain. Every day you amaze me in small ways. But that day you absolutely blew me away. I saw your strength in its rawest form and a passion so deep that even when faced with your breaking point you refused to be beaten down. As you walked off the field and came towards me with a renewed exhilaration, I got just a glimpse of the young man you are going to become rather than the child that still belongs to me. What you taught me is that as you continue to grow, the real measure of my parenting is not going to be about the decisions I make for you, but rather recognizing when the decision are no longer mine to make. Even harder is going to be acknowledging that sometimes you’re going to be ready before I am, and that I may not always understand your choices and decisions. However, no matter what, I will always stand on the sidelines and cheer you on, even if I’m crying at the same time. You are Perfect, PINK! and Lessons on Motherhood.